Concentricity measurements on the removed flight seal on the Ground Umbilical Carrier Plate (GUCP) have found at least one of the potential root causes for last Friday’s leak, with a forward plan to install a replacement carrier plate and seal ahead of a potential Tanking Test. 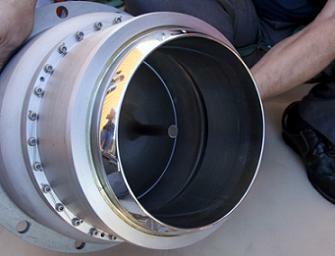 Plans are also being worked to install a doubler to the cracked intertank stringer, whilst at the pad. Discovery continues to undergoing a dual effort to troubleshoot the two main issues which are restricting her from conducting the final launch of her esteemed career, resulting in a delay to at least November 30. However, making that window is becoming more hopeful, as the chances of rollback appear to remain highly unlikely. While engineers take advantage of the delay to conduct work on replacing circuit breakers associated with the Main Engine Controller (MEC) on ME-3, regarded as an Unexplained Anomaly (UA) but cleared for flight by the Mission Management Team (MMT), another Interim Problem Report (IPR-54) – relating to a missing digit on the Forward Mission Event Timer (MET) is also being resolved. “IPR 0058 Main Engine Controller: Panel L4 removal is scheduled to begin Friday morning. 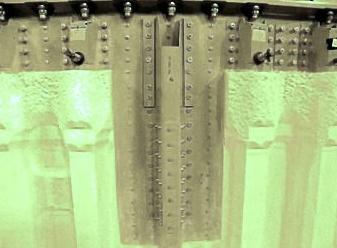 Once routed to the NSLD (NASA Shuttle Logistics Depot), 18 circuit breakers will be replaced. 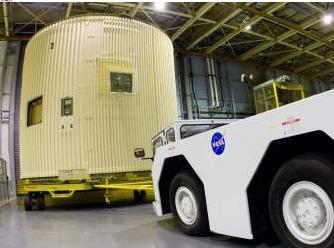 L4 is expected to be back by Tuesday, when installation will begin,” noted the NASA Test Director (NTD) report on L2. “On Wednesday, the ERB (Engineering Review Board) agreed and approved additional troubleshooting on Panel R2. The forward plan minimizes retest and will not create an OMRS (Operational Maintenance Requirements and Specifications) violation/waiver condition and will not require access into the aft. The SCAN retest will be picked up the next time we perform the engine controller checkout. Engineers have found a – or even the – potential root cause for Friday’s scrub, with inspections of the flight seal, which show it to be “asymmetrically compressed”, along with uneven marks on the Quick Disconnect probe. Inspections confirm the condition of the hardware does not match the observations documented when it was installed on the tank inside the Vehicle Assembly Building (VAB). “IPR 0068: GH2 Ground Umbilical Carrier Plate (GUCP) leak: On Wednesday, the 7” QD was de-mated, the flight seal was inspected and then removed. The Carrier Plate assembly (SN 2) was also removed. The flight seal was found to be asymmetrically compressed. Similarly, an uneven witness mark was identified on the ground QD probe corroborating what was observed on the flight seal,” added the NTD report. “Concentricity was also measured while the seal was installed to provide a comparison to the measurements taken during initial QD installation in the VAB. Preliminarily, the concentricity measurements seem to indicate that we are less concentric following the leak then when we first had measured concentricity during QD installation in the VAB. Changing out the hardware – centered around a replacement carrier plate and new flight seal could begin as early as Friday, with planning taking place through Thursday to confirm the forward plan. “The new carrier plate (SN 3) was previously fit checked on ET-137 at MAF and yielded substantially better concentricity values than was obtained with SN 2. SN 2 carrier panel will undergo laser scanner operations and those results will be compared with the SN 3 panel. It is also likely – but unconfirmed – that the forward plan would involve a Tanking Test on the reinstalled GUCP hardware, as was previously seen after the second STS-127 scrub. Managers will use the experience of the STS-127 Tanking Test as the baseline, should they opt to press forward with loading the tank to confirm the leak has been resolved. “ET Tanking Test Planning: An engineering requirements meeting was kicked off Wednesday. The team performed a quick overview of the expected vehicle/GSE (Ground Support Equipment) configuration baselined from the STS-127 test configuration. 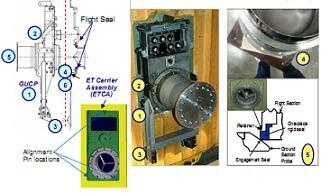 UPDATE: The latest information points to the main problem being with the carrier plate, as opposed to the seal itself. In support of a Tanking Test – though a nominal pre-launch operation – five tankers are scheduled to arrive Pad 39A to replenish the LH2 storage tank. Getting to the point of a Tanking Test will depend on the successful repair of the two cracks – and subsequent Thermal Protection System (TPS) foam repair – in the area of the Intertank/LOX tank flange. Officially characterized as “definitely a result of a structural failure of the stringer“, the cracks are likely to be the contributor to the defect observed in the foam – which has since been removed, in turn revealing the damage in the stringer. The stringers are manufactured using a lighter weight, stronger material of Aluminum Lithium, which was initially incorporated with the Super Light Weight Tank (SLWT) on ET-96 and first flown on STS-91. While the material is stronger and lighter in weight, it is more brittle and has resulted in increased cases of cracked stringers in the areas noted. Had Discovery completed a nominal tanking and launched last Friday, analysis shows the intertank would have had sufficient structural capability for the launch and ascent environments with the cracks in a single stringer. NASA also note that although the foam was firmly attached to the damaged structure, it is undesirable to launch in this configuration – a likely reference to the potential threat of foam liberation impacting the orbiter. The plan to repair the area still concentrates around in-situ work at the pad, allowing engineers to install a second piece of aluminum known as a doubler to the damaged area – as was previously conducted on ET-138 during its production at the Michoud Assembly Facility (MAF). BX foam then will be sprayed over the newly repaired stringer, requiring approximately four days to cure. However, Friday’s key meeting will decide on the viability of the plan, with previous notes stressing the need for an environment tent/hood to be placed over the worksite, as a condition of spraying foam on to the tank. “IPR 0072: ET LO2 IT foam crack: During the foam removal, two cracks were found on the stringer on both the left and right side along the fastener points. 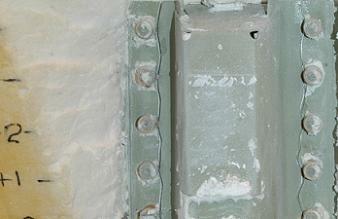 The cracks are approximate 9″ in length with gap of approximately 0.05″. The foam has been removed, so the full extent of the visible crack has been exposed,” noted the NTD. A full update will be forthcoming on Friday via a new article.